We are a leading Manufacturer of tooth pest powder mixing pan, pest boiling tilting pan and steam boiling pan from Vasai, India. 3. High quality ceramic insulations with s.s cover. Production Capacity: 50 TO 500 KG. 2. SS-304 (8% Nickel) Salem Steel Material. 6. Our Machine shall Incorporate fitting like ARV, SRV, Steam trap, strainer pressure gauge etc. 7. 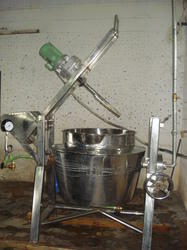 Two Speed scraping stirrer. 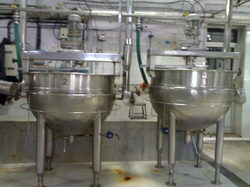 Production Capacity: 50 TO 650 LTRS.